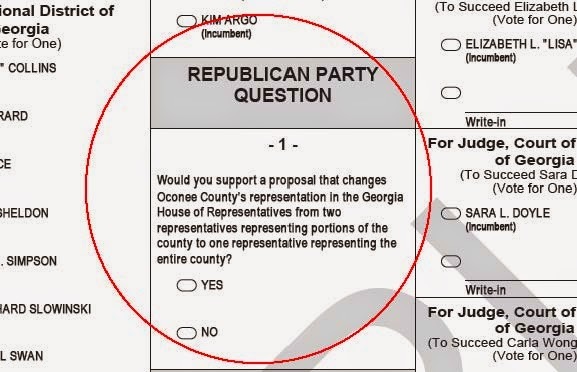 The question asks voters if they support changing the district lines for Quick’s 117th District and Williams’ 119th District to bring Oconee County back into a single district in the Georgia House of Representatives. The best guess is that only about 4,200 of the county’s 21,933 active voters will have cast a ballot by the end of the day on Tuesday, and about 3,750 of those who did cast a ballot will have voted in the Republican Primary. Yet the data offer the first real test of support for the so-far unsuccessful efforts of Quick and Williams to get their district lines redrawn. By the end of the day today–the final day of two weeks of early voting–1,572 persons had cast a ballot in Oconee County, according to Pat Hayes, chair of the county’s Board of Elections and Registration. Those 1,572 voters represent 7.1 percent of those eligible. In the July 2012 primary election–the election most comparable to the primary on Tuesday–3,709 of the county’s 21,632 registered voters, or 17.1 percent, cast an early ballot. In that July 2012 primary, 45.7 percent of the county’s voters ultimately ended up casting a ballot, either in early voting or in election day. If that same pattern holds, only about 19.0 percent of the county’s 21,933 eligible voters, or about 4,167 persons, will cast a ballot this year. Of the ballots cast in early voting, 90.2 percent had been in the Republican primary. If that ratio holds on Tuesday, about 3,750 will have cast a Republic ballot by the end of the day, and some percentage of those will have answered the ballot question on redistricting. Polls open at 7 a.m. and close at 7 p.m. on Tuesday. All of Oconee County had been in a single House District until the special redistricting session of the Georgia General Assembly in 2011. In that session, the House voted to split off three precincts from Oconee County, Athens Academy, Malcom Bridge and Bogart, in order to make a more favorable district for incumbent Doug McKillip, who had switched from the Democratic Party to the Republican Party. Quick defeated McKillip in the 2012 Republican primary in the new district and made a pledge, if elected, to try to change the district lines so all of Oconee County is once again in the same district. The Oconee County Board of Commissioners subsequently voted unanimously to ask her to do just that. In the 2014 session of the House of Representatives, Quick and Williams sponsored House Bill 781, which would have shifted the three Oconee County precincts from Quick’s district to Williams’ district. That bill was assigned to the House Legislative and Congressional Reapportionment Committee, but the Committee never met. In the session the year earlier, the Legislative and Congressional Reapportionment Committee had met only once and took no action. Williams told me last month that he knows of “a lot of legislators around the state who would like to do some tweaking” of legislative districts, and he thinks there may be a better chance for his and Quick’s request in the 2015 session. Hayes, chair of the county’s Board of Elections and Registration, told me that the Republican Party ballot item was submitted by the County’s Republican Party. Quick told me tonight that she had been aware of interest on the part of the county’s GOP executive committee to ask voters about redistricting but had not seen the final item submitted. Quick said she will be attentive to the outcome of the voting to get a sense of voter sentiment on the issue. She said she remains committed to working toward changes in the district lines if county officials and the public want her to do that.